With Flurry Analytics in the role of Processor with regards to the data covered by GDPR, it is your responsibility to respond to Data Subject Rights (DSR) requests from your users. This documentation describes the usage of the APIs that Flurry makes available for supporting these DSR requests you receive. 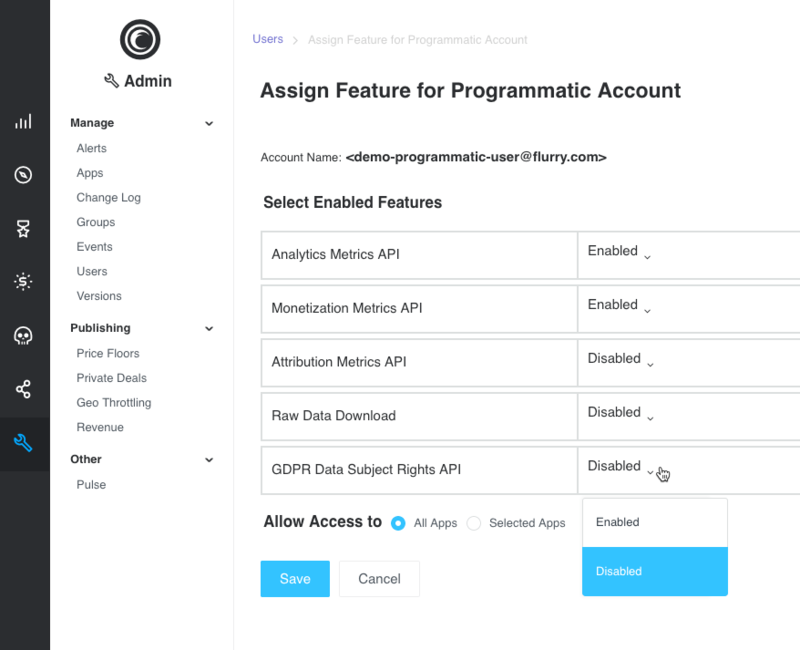 As with any Flurry API, in order to use the GDPR APIs, you must first create a Programmatic Token. You can read about how to do that here. The token must be assigned permissions to access Flurry’s GDPR API. To achieve this, after the programmatic account has been created, find the user account on the Admin > Users page and click the pencil icon to edit the user. Then, select Enabled for the GDPR Data Subject Rights API as shown below. Once you have a Programmatic token that has GDPR API access granted, you can return here to start the integration. Deletion - Flurry will permanently remove all the data collected. Given the permanence of this action, this request has a built in execution delay of 48 hours. Restriction - To service a Restriction DSR, you must first download the subject data via an Access request and then issue a Delete request. Objection - Flurry will permanently remove all the data collected to date and stop the processing of any data sent in the future. As with Deletion, this request has a built in execution delay of 48 hours. Please Note: In each of the above cases, the APIKey is optional and in its absence data will be returned for all apps to which the Programmatic Token has access. There are other DSRs for which Flurry does not provide any support. Rectification - Flurry considers the data collected by your use of Flurry Analytics as “Observed Data”, which is immutable. Initiating a request for data subject rights. This process creates a ticket to record the request and can be monitored for progress and status updates. Querying the status of an existing ticket. Request status has a simple linear transition between the states of ACKNOWLEDGED, PROCESSING, and COMPLETE. Downloading client data after a request for Access has successfully completed. Canceling a request for data erasure. Flurry allows request cancellation during the period of time between request submission (ACKNOWLEDGED) and the beginning of request processing (PROCESSING). Searching for an existing ticket(s) by submission time, device identifier, and other ticket attributes. *TOKEN* should be replaced with the value of the programmatic token. The device identifier type associated with the data subject right request. curl -g -X POST -H"Content-Type: application/vnd.api+json" -H"Authorization: Bearer $TOKEN" "https://datarequest.flurry.com/gdpr/v1/ticket"
Acknowledged - The initial state of the ticket. Processing - Flurry has begun processing the request. At this point, the ticket can no longer be canceled. Complete - The ticket was successfully completed. NoData - The ticket was successfully completed but no data was found associated with the requested device identifier. Canceled - The ticket was canceled by the developer. creationDate The date and time the ticket was created. modifiedDate The date and time the ticket was last modified. downloadURL If the data subject right includes the ability to download data, a unique URL to fetch from. id A unique identifier that can be used to track the status of the ticket. companyId Identifies the company associated with this ticket. curl -H"Authorization: Bearer $TOKEN" "https://datarequest.flurry.com/gdpr/v1/ticket/2"
data - a JSON encoded text file containing all of the data requested. schema - a JSON schema formatted file which describes the structure of the data file. It is expected that the schema format will evolve over time. Developers should only use the schema bundled together with the data when attempting decoding. The latest schema can be downloaded here. Once expired, the underlying data is deleted and a new ticket must be created to fetch the same data. Developers can cancel requests that have not yet started processing. For requests involving data erasure, Flurry will wait for up to 48 hours to begin processing the request. During this window, it will be possible to cancel requests by updating the status field of the original request ticket to the CANCELED state. PLEASE NOTE: Once an Erasure request has been processed, it cannot be reversed. Cancellation of an Erasure MUST occur within the 48-hour window. If Flurry cannot cancel the request because processing has begun, the API will return a 403 error to the caller. curl -g -X PATCH -H"Content-Type: application/vnd.api+json" -H"Authorization: Bearer $TOKEN" "https://datarequest.flurry.com/gdpr/v1/ticket/2"
The collection of pre-existing tickets is filtered by attaching a *filter[ticket] *query parameter to the request URL. The value of the filter parameter consists of one or more boolean predicates separated by conjunction (logical and) and disjunction (logical or) operators. Predicates have a simple form: attributeName operator *value *with no intervening whitespace. == Evaluates to true if the attribute exactly matches the provided value. =in= Evaluates to true if the attribute exactly matches any of the provided values. The set of values is enclosed in parentheses and separated by commas. =out= Evaluates to true if the attribute does not match any of the values. The set of values is enclosed in parentheses and separated by commas. ==ABC* Similar to SQL like 'ABC%'. ==*ABC Similar to SQL like '%ABC'. ==\*ABC\* Similar to SQL like '%ABC%'. =lt= Evaluates to true if the attribute is less than the value. =gt= Evaluates to true if the attribute is greater than the value. =le= Evaluates to true if the attribute is less than or equal to the value. =ge= Evaluates to true if the attribute is greater than or equal to the value. =isnull=true Evaluates to true if the attribute is not set. =isnull=false Evaluates to true if the attribute is set. filter[ticket]=apiKey=isnull=true Where apiKey is null. curl -H"Authorization: Bearer $TOKEN" "https://datarequest.flurry.com/gdpr/v1/ticket?sort=-modifiedDate"
page[size] The total number of tickets to return in the response. The size of the page. Any positive integer. page[number] Which page number to return (starting at 1). Each page has page[size] records. Any positive integer. curl -H"Authorization: Bearer $TOKEN" "https://datarequest.flurry.com/gdpr/v1/ticket?page[size]=1&page[number]=1&page[totals]"
Whenever a pagination parameter is specified, the response includes a meta block that includes information about the current page and/or the total number of records & pages. 200 Returned after a successful HTTP GET to query a ticket. 201 Returned after a successful HTTP POST to create a ticket. 204 Returned after a successful HTTP PATCH to cancel a ticket. 400 The entity body or a query parameter was malformed. 401 The client has invalid, expired, or missing credentials. 403 The client does not have permission to perform the requested operation. 408 The request took too long to complete. For search requests, consider using pagination or filters to restrict the response. X-RateLimit-Limit: The maximum number of credits that the consumer is permitted to charge. All requests consume at least 1 credit but can cost more depending on the resources consumed. X-RateLimit-Remaining: The number of credits remaining. This number can go negative. X-RateLimit-RefillPerMinute: The rate (credits/minute) at which credits are refilled. 500 The GDPR service had an internal error. The request can be reattempted at a later time/date. It is possible to test against the API by creating a ticket with a *Test *deviceIdType. Any string value can be used for the deviceId. The service will immediately update test tickets to the *COMPLETE *status. It should also be possible to download test data and the corresponding schema. However, the test data will be generic and not tied to the event model for your application(s).